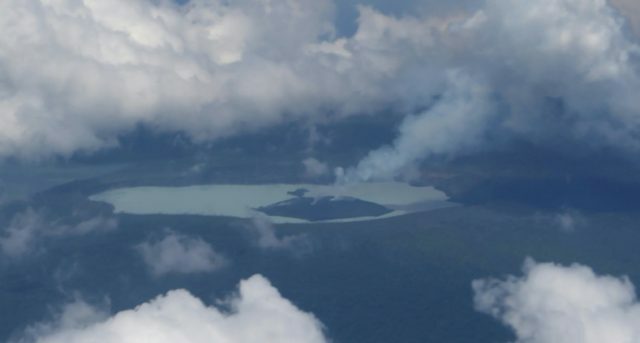 Wellington (AFP) – Villagers fleeing a volcanic eruption in Vanuatu face food and water shortages in overcrowded evacuation camps, aid workers and reports said Wednesday. About 7,000 people on the island of Ambae — in the Pacific archipelago’s north — have left their homes after the Manaro Voui volcano rained rocks and ash on their villages. The volcano sent up a plume of steam and ash over the weekend after weeks of rumbling, prompting authorities to declare a state of emergency. They have also upgraded Manaro Voui to a level four alert, representing a “moderate eruption state”, and warned of “flying rocks and volcanic gas” up to 6.5 kilometres (four miles) from its crater. However, aid workers said a more immediate concern was conditions in the 35 evacuations centres set up outside Ambae’s exclusion zone. The area was already experiencing a dry spell and ash has now blanketed crops and water sources. Manuel Ure, a disaster coordinator with the local Penama provincial government, said conditions in the camps were difficult. “We have very limited shelters, we have very limited food and water and other necessities… we are facing a lot of challenges at the moment,” he told Radio New Zealand. Red Cross coordinator Augustine Garae said the continuing influx of people was putting more pressure on the camps. “The number of evacuees is expected to rise, making facilities at evacuation centres (such) as proper toilets and sanitation not enough for everyone to access,” he told the Vanuatu Daily Post. A boat with supplies and volunteers left the capital Port Vila on Wednesday and more are expected in the coming days. A New Zealand Air Force plane conducted an observation flight over the volcano on Tuesday, gathering data to help scientists assess the risk of a major eruption. The volcano, also known as Aoba and Lombenben, has three lakes in its crater and last erupted in late 2005. On that occasion about 5,000 people were evacuated and it was three months before the volcano settled enough for them to return home.